Jamie Dunsdon is the Artistic Associate/Apprentice Artistic Director at The Grand Theatre in London, ON for the 2013/14 season. She is also the Artistic Director of Calgary’s Verb Theatre (on leave 2013/14 season), and an active director, playwright, performer, and arts instructor. 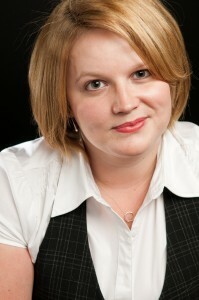 Jamie regularly teaches for the University of Lethbridge, Evergreen Theatre, and Calgary Young People’s Theatre. Jamie’s interests and work spans the theatrical spectrum, ranging from contemporary Canadian drama to musical theatre to Shakespeare. She places particular value in chararacter, and seeks out stories that place emphasis on the stylistic intersections beween content and form. She embraces statements that begin with “What if theatre could __________?” and strives to ensure that her theatre is both accessible and intelligent. First, theatricality. There are a lot of great stories that absolutely deserve to be told, but I look for the ones that are best told by theatre. I.e. What does the medium of theatre offer this story or this exploration of idea that other mediums do not offer? Second, I look for an intersection between form and content. If the way you tell your story mirrors or comments on the content of the story itself, I’m often much more interested in it as a theatre piece. It’s what makes The Last Five Years a theatre piece instead of a Taylor Swift song. This is less of a quantitative concern for me, and more qualitative. One really enlightening workshop is far more useful than seven stagnant workshops. A workshop that gives a sense of how the play functions on its feet is stronger for me than just a reading, although I think some scripts benefit more from this than others. If you are writing something highly stylized, I recommend at least two workshops: one for story and one for style. Well, from a playwriting perspective, I say no—tell your story with the number of characters and the amount of time you need to tell it. If that’s a nine-hour play with 13 women and a goat, so be it. That said, from a producing perspective, there are certainly considerations that will make your play more or less attractive to certain companies. I don’t think you should have this in mind while writing, but as you’re trying to find that first production it might help you target the companies that are most likely to produce it. A 70-90 minute one-act with two actors is relatively affordable for small professional companies, so that’s what I’ve got my eye out for right now. Don’t forget that universities and community theatres (who don’t have to pay actors) are often looking for large-cast shows. Short one-acts are rarely produced on their own in professional settings, although Lunchbox Theatre in Calgary does great work in that regard. Short one-acts with big casts are even less likely to be produced except by high schools or at festivals. Intermissions are sources of revenue for larger companies who sell food and drinks in the lobby. A 90-minute show could be a one-act, but if there is a natural breaking point in the middle that won’t destroy the momentum of the piece, consider giving the producing company the option of placing an interval. Well, not really, but I prefer the left-aligned model with the dialogue on the hanging indent (as opposed to the center-aligned format). It kills fewer trees and is more often true to the 1min/page rule, which I use to schedule rehearsal time. I think everyone has a different preference, though. I also don’t love Courier font for some reason. Silly, but there it is. Actually, what’s more useful to me is having access to a digital copy, pdf or .doc. For the love of Pete, please don’t tell me on which side of the stage something should happen or how the set looks unless it really, really matters. Keep it simple—give me just enough information to understand the story and to inspire my imagination. I don’t love emotional denotation either, unless the words really need clarification. Let the actors find their delivery. Over explanatory dialogue. Namely, characters casually telling each other things they already know in an attempt to reveal exposition. I can care about almost anything if the delivery is intriguing. I think the obvious ones are about length of scenes and number of locations, which, in film, are shorter and more numerous, respectively. This can be tricky to achieve in theatre. I’ve seen some genius ways of doing this on stage, so it’s not a blanket condemnation, but regardless, it’s more and more difficult to find playwrights who know how to write extended scenes. Treatment and representation of female characters is often at its worst in film/tv. I appreciate that this goes back further in history than film, but I think the ubiquity of it in cinema has infiltrated theatrical writing. Don’t be afraid to write real women. Familiarize yourself with the Bechdel Test, as well as other female tropes and stereotypes. I always hear people say “write what you know.” I’d rather people write what they don’t know. Write what you wonder. I am very, very excited by the potential. I’m a bit nervous about the way new plays are being programmed, though. I think there’s a bit of a cult of personality that affects which playwrights are given grants and even premieres. I’m concerned that the name/reputation of the playwright sometimes seems more important than the quality of the work. Nobody owes you anything, so don’t get bitter. See theatre. Lots of it.